The Leadership Team meets every 6-8 weeks in person, and holds online meetings in between as required. In addition the team uses an online communication platform to manage the day to day task of running Doula UK. If you have experience writing grant funding applications, and would like to help Doula UK secure grant funding for essential projects such as investment in our website and the creation of resources for Members and the general public, please get in touch. Do you have a background in media, law, education, IT project management or web development? If you’d like to volunteer to share your expertise with Doula UK, we’d love to hear from you! All positions are open to Members and Friends of Doula UK. A successful candidates who does not fall into either category will be invited to become a Friend of Doula UK at no cost. 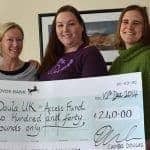 Doula UK is a voluntary organisation, run by its members. While out of pocket expenses associated with volunteering are reimbursed, please be aware that none of the above are paid roles.